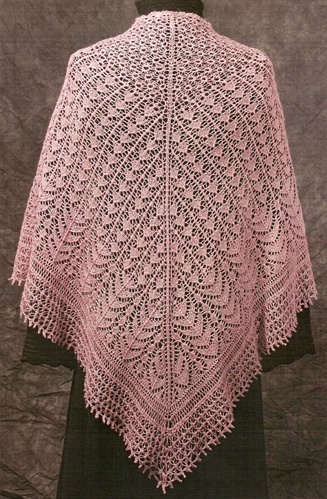 The Chantilly Shawl is a frothy confection of delicate lace. Traditional patterns combine to create a rich, yet very feminine appearance. The shawl is worked by casting on three stitches at the top, then increasing to create a triangular shape. It is finished with a point d'esprit edging, worked sideways. 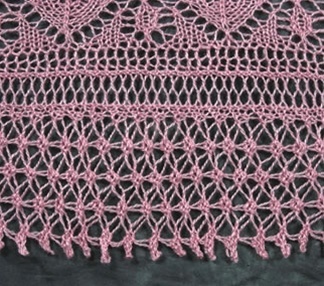 Recommended for Experienced lace knitters. Finished size is 70" along the top edge, and 36" down the center back after blocking. 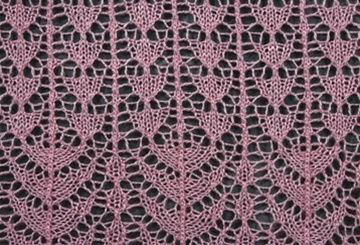 Takes about 980 yards of lace weight yarn.